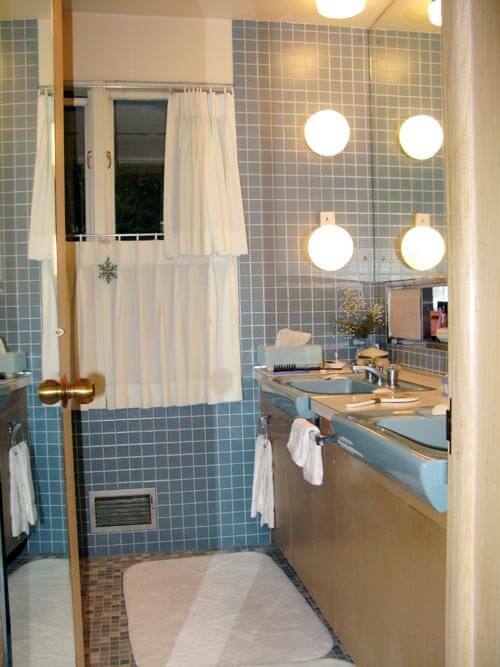 Thanks to all the readers who uploaded photos of their awesome vintage bathrooms and bathroom tile recently. What a treat it was to get a look into your loos! With 171 photos, it took quite a bit of work to narrow it down to the featured 12. 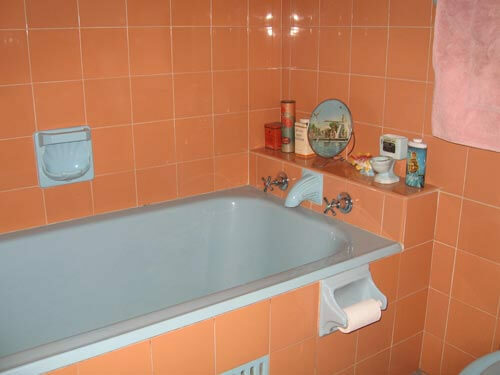 I tried to pick bathrooms with interesting color schemes, unusual and detail oriented tile jobs — it was really impossible, there were so many terrific vintage bathrooms — but here are 12 of my favorite original bathrooms. 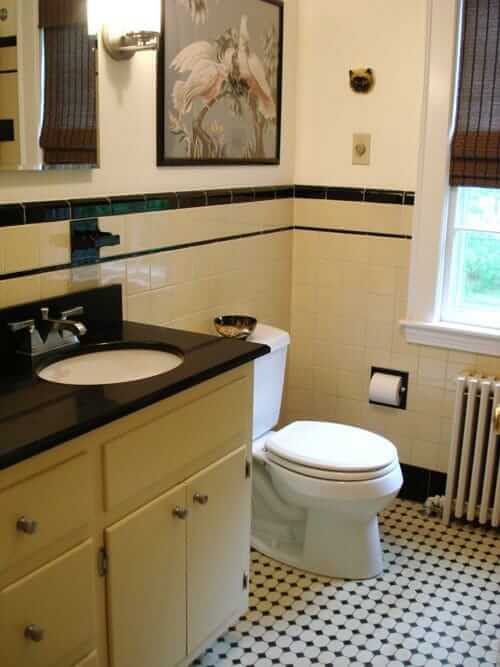 Above: Jeanne’s vintage grey and black bathroom tile caught my eye because of the classic, high-quality two-tone pinwheel floor tile and the thin black liner tile, set low, that ties in with the black toilet paper holder. Such a great detail! Above: DJS from Brecksville, Ohio has a lovely original Regency Blue bathroom with American Standard Fixtures in their 1961 ranch. 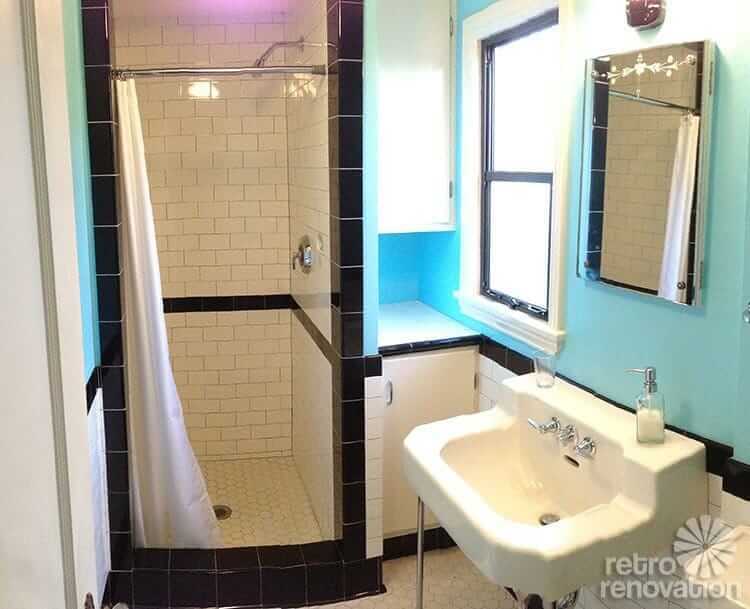 The blue wall tile looks smaller than the more common 4 inch square tile from this era — giving folks who need to do a gut remodel of their mid century bathroom another view of what a smaller-tile alternative would look like. I also love the hand towel bar in between the sinks, the sliding-door storage cabinets recessed right into the wall mirror (Fantastic idea! 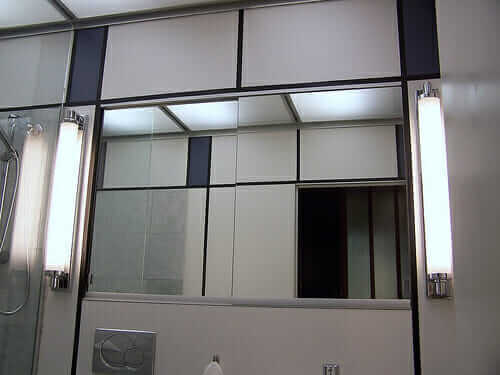 ), and the mod light fixtures. 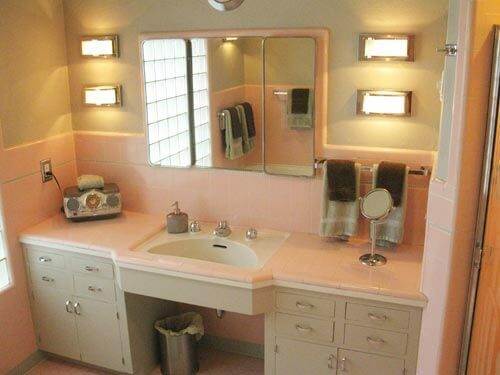 Above: You know I couldn’t leave out the pink in my list of favorite reader tile bathrooms — Todd A. has a pink and grey tile combo going on in his bathroom. I’m especially in love with the way the bullnose tile wraps around the mirror cabinet and the sink… and it looks like the shower (on the right) comes in at an angle. That is serious tile work! Above: Scott’s peachy keen vintage bath in Florida really got my heart fluttering — I love the speckled floor, the color scheme and wow, have you ever seen vanity quite like this one? Usually I’m not a double-sink type of person, but this configuration is amazing. I wish my master bath had enough room for one of these. Above: I’m loving Bird and Ernie’s yellow and black 1948 bathroom. So many bathrooms in this style are simply black and white — which is a classic and sophisticated choice — but the pale yellow with the black and white takes it up a notch. Also — is that vintage wallpaper or fabric I spy in the frame above the toilet? The design is just perfect — great touch. 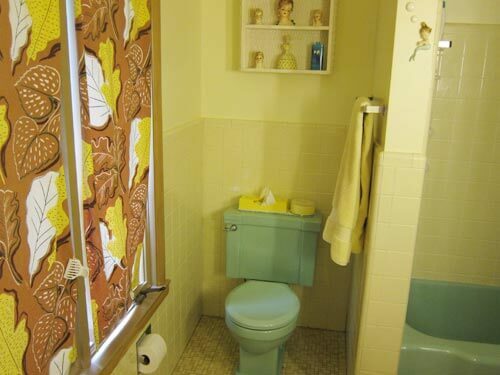 Above: Rebecca’s 1959 sunny yellow and mint green vintage tile bathroom is a cheery spot, for sure. 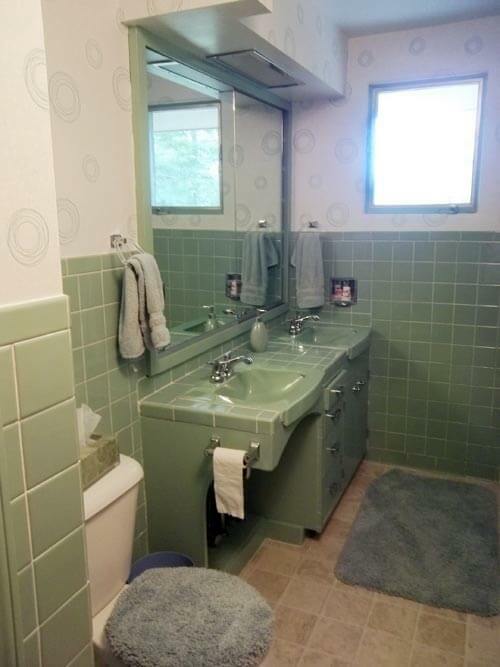 I have the same minty green tub in my hall bathroom and wish that my white tile was yellow like Rebecca’s instead. I’m loving her choice of fabric for the window shades, too — ties in nicely with the core colors. Above: Kevin B. Wagner has quite the awesome orange tile and coordinating laminate countertops in his Bob Beharka designed house. The wood trim and ceiling details are an interesting choice for a wet area of a bathroom, but by the looks of it, they’ve held up well over the years. Pam says she loves how the wood trim above the shower and holding the overhead light add modern architectural detail — allowing for the addition of a clerestory window above the shower action — nicely done. Above: Lynne’s very green bathroom caught my eye because of the vast amount of the same shade of green tile — and vanity painted to match. I have to wonder if the original floor and toilet were also green? All the vintage bathroom sinks we’re seeing today are pretty cool, don’t you think? 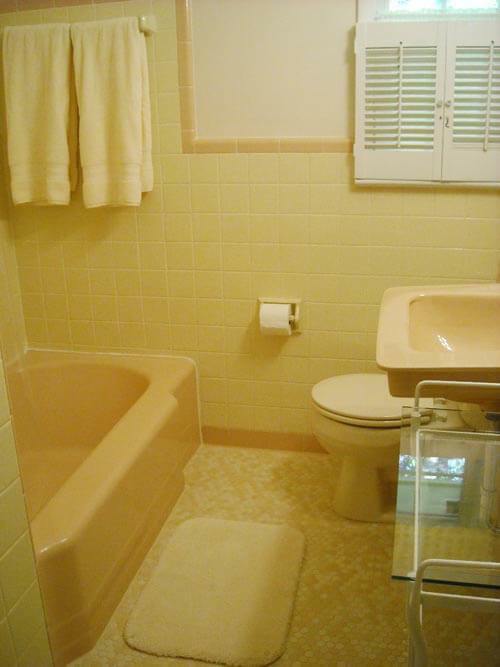 Above: Margie C. has an awesome Yellow and peachy bathroom. I‘m loving the floor — which she installed to correct someone else’s “update.” This is another color scheme that is so light, sunny and timeless — I could see myself using these tiles in my house — and loving them forever. 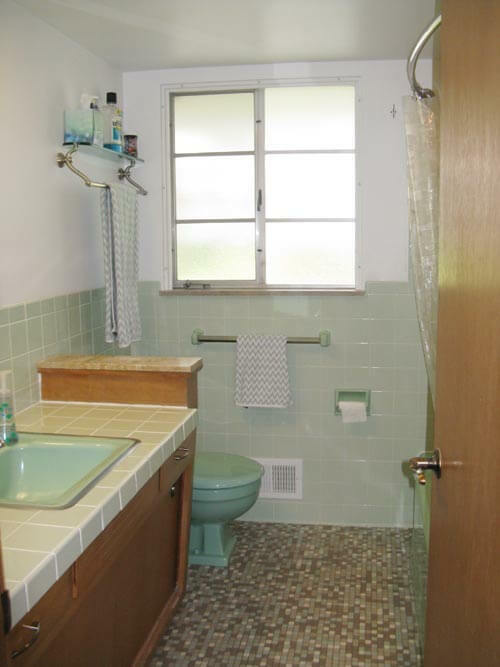 Above: This reader’s 1958 minty green and brown original bath is another favorite of mine. From the vanity to the mosaic floor to the layout, I love it all. It even looks like they kept the original aluminum window! 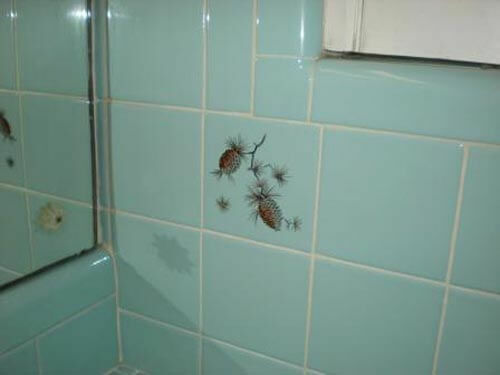 Above: And finally, Lynn’s Aqua tile bathroom has some kitschy and cool pine cone detailed tiles! I was so happy to see the yellow and Ming Green bathroom. Mine is very similar but I think my yellow tiles were swapped out at some point with rectangular speckled yellow/white tiles. I’d love to tear all that out and replace them with 4 inch yellow tiles. I’d also like to do an accent trim but what color? I’m thinking pink. My floors were also redone with Home Depot flooring that was a weak attempt at “updating” the bathroom. Some day that will go and be replaced by a nice white and yellow mosaic – maybe a pink tile every now and again for accent? Pam & Kate, thanks for featuring my peach & yellow bathroom with the new 1″ hex floor tile in the blog entry! What started it all was the need to replace the original 1958 toilet (I’m told the peach color probably “Tuscan Tan”) when the tank cracked. As long as I had to replace the toilet, I decided it was my one chance to put down this great tile I’d had waiting for 2 years. I’ve saved the peach toilet, cracked tank, and lid, hoping I can find a solution to the crack that will work, or that one day I’ll find a matching color in a vintage toilet. In the meantime, the new toilet (a Mansfield in “bone”) goes nicely with the pale yellow speckled wall tile, works like a dream with 1.6 gal. flush and my water bill has gone down (which I love), but it sure would be nice to have it match the sink and tub. When is someone going to invent spray paint that will work over ceramic? BTW, the sink is a 1961 Kohler with Jetson-esque handles I found at the Habitat thrift shop, replacing a really tiny white pedestal sink that the seller had installed when the house was a rental. 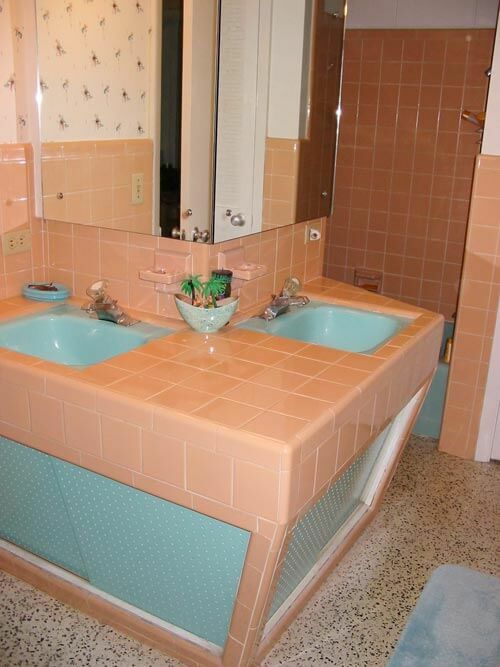 I don’t know what the original sink or vanity was like. 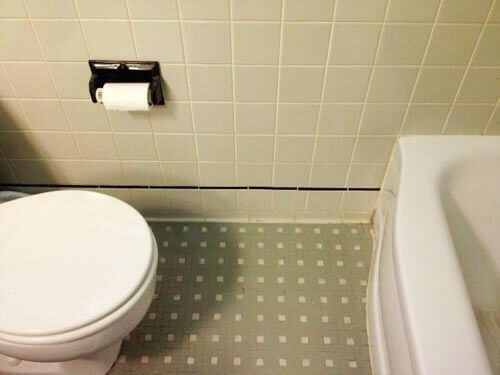 Now, if only I can find the money and time to get the cast iron pipe under the toilet repaired in my half bath (pink) so I can have that room fully functioning again. Love the blog!! Love your readers’ suggestions. I love Scott’s peach and blue bathroom! I believe his floor is terrazzo. I would love to see a closeup shot of the floor and know what area of Florida he is in, it looks like it might be similar to mine. While I love the floor it can limit some of the color and pattern choices one makes in their house, but I think Scott did a great job. My floor has pink, dark peach, brown and black chips in it, works well with my pink tiled bath, but poses a challenge for my powder blue bath! I am also jealous of all of his outlets, they look so well integrated! The tile on “Scott’s Peachy” is on sale for $1/s.f. at the Riverside Habitat Re-Store right now–big pallets of it in the parking lot today. Sorry, I meant “Scott’s Peachy” floor. I have a bathroom that is basically the same design as Lynn’s..it has this green tile like hers and I feel like it doesn’t go with any color. 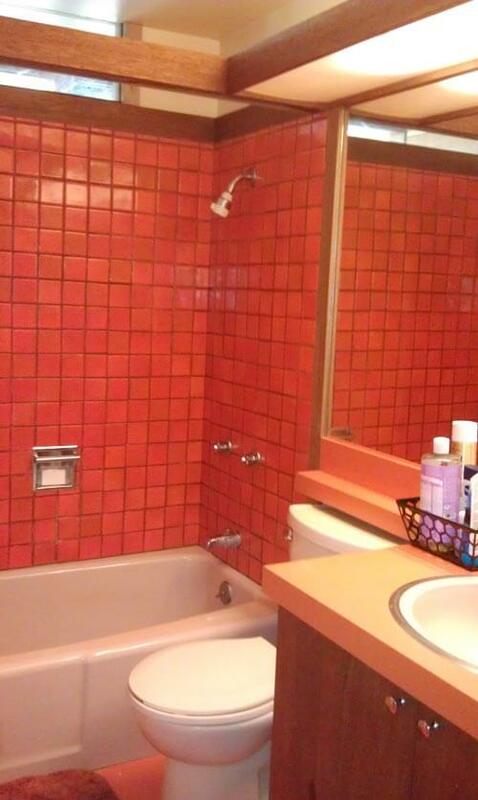 I wanted to make the bathroom look more modern without spending a lot of money or without having to redo the tile. Do have any suggestions for a paint scheme or something to make it pop like stencil? 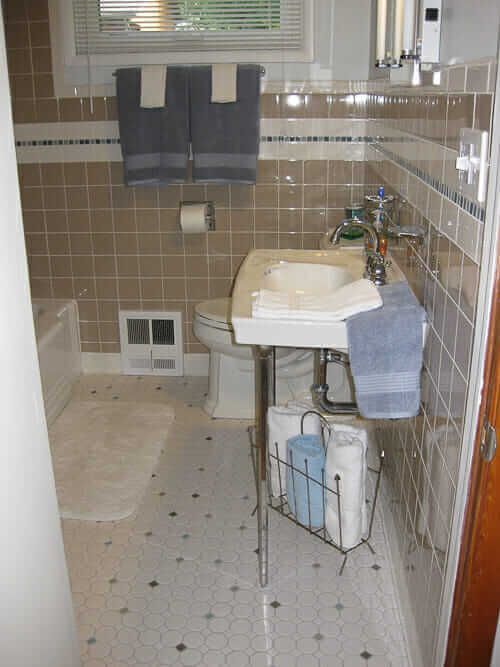 Its a small bathroom and I want to do something that will help the house sell. I like neutral colors like tan and gray. Thanks for your help! 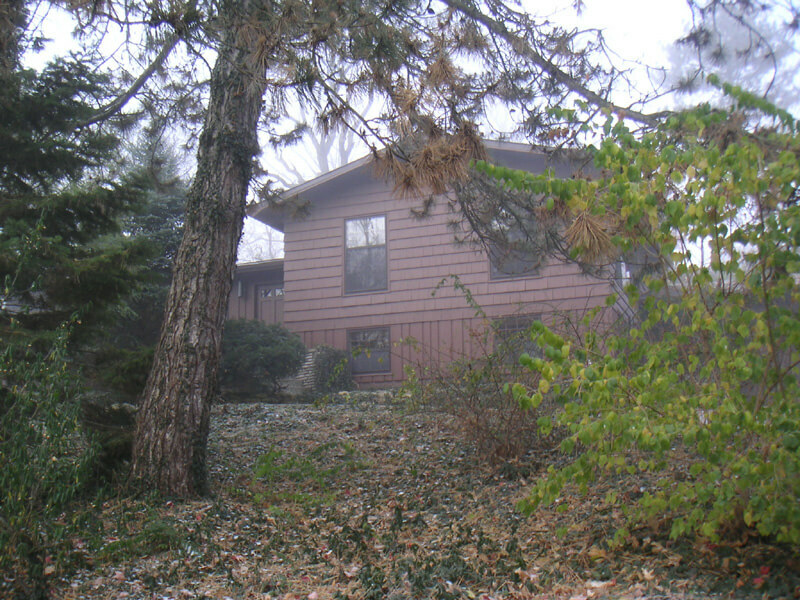 I don’t plan on selling my house for a long time but I have been trying to update it so whenever I do sell it itll look.nice. I have done the kitchen and living room but I am stuck trying to find something that will look okay with green tile and still look modern..do u think gray will look good and maybe a black stencil or should I try a different color? Thank you so much. I emailed the pictures to the email address! Thanks again!